If you have a small collection of bookmarks, say five or fewer, the easiest way to move them is to copy the URLs and add them to Quick Links. If you have a larger collection, we suggest either importing them into your browser, or using a note tracking tool, such as OneNote or EverNote, or a document in One Drive or Google Drive to manage those bookmarks. 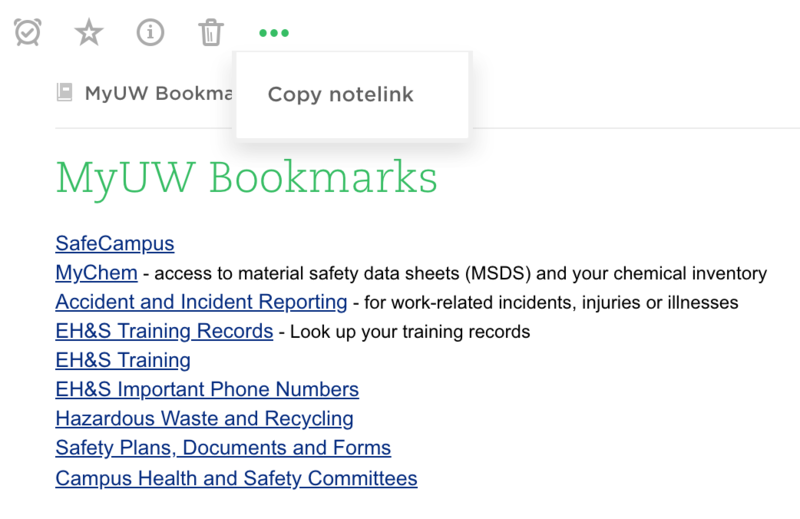 If you have a large collection of bookmarks, rather than adding them to the new MyUW, you can save them from the legacy MyUW and keep them in a Google, OneNote or Evernote repository. Add a link that goes from Quick Links to your collection. That way, you still have quick and easy access to all the resources you’ve saved, right in MyUW. Go to your bookmark collection in the legacy MyUW. Select a list of bookmarks and copy the list. Open the application where you want to save your collection. In Google Drive, open a new Google Doc. In OneNote, open a new notebook or add a section or page to an existing notebook. In Evernote, open a new note or notebook. In your chosen application, paste the copied list of links. From a Google or OneDrive doc: Insert your cursor in the address bar of your web browser. Select and copy the URL. From OneNote: In the left sidebar, right-click the page name. On the shortcut menu, click Copy Link to This Page. From Evernote (web version): Click the More menu (three horizontal dots), and then click Copy notelink. With the URL for your bookmark collection copied, go to http://my.uw.edu. At the bottom of the Quick Links area, click add your own. In the text field, paste the copied URL and then click Save. The URL will appear at the bottom of the list of Quick Links. You can import your bookmarks to your browser all at once by importing an HTML file. The first step is to save your copied bookmarks as an HTML file. In the legacy MyUW, select and copy a list of bookmarks. Paste the list into a Google or Word document. Save the document as an .html document. In Word, choose File, click Save As. At the bottom of the Save As dialog box, in the File Format drop down menu, select Web Page (.htm, .html). Enter a file name and save the file. You may need to add the .html file extension in order for the browser to recognize the file correctly. In Google Drive, select File, then Download as, then Web page. A .zip file will download. Open the .zip file and then save the enclosed .html file to your computer. 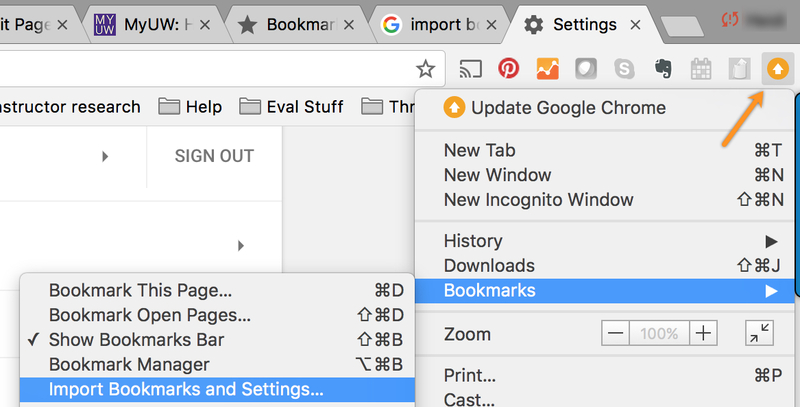 We recommend importing bookmarks into Firefox as an initial step because other browsers (e.g., Chrome, Safari, or Edge) might not successfully import the .html file you have created. You can still import your bookmarks to your preferred browser. You will simply use Firefox as an intermediate step in the migration process, import your bookmarks into Firefox, and then export them. 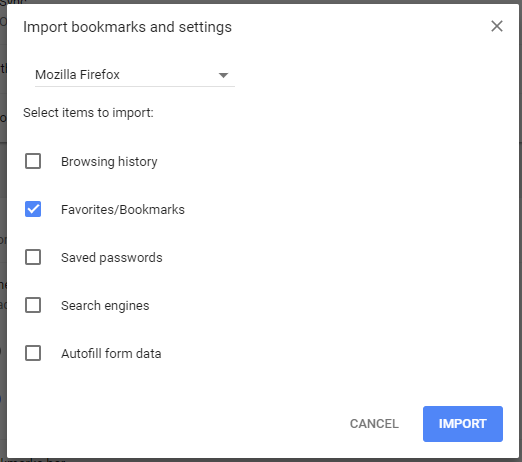 Then, in your preferred browser, use the Import bookmarks from Firefox option to successfully import the bookmarks into your preferred browser. Use the links below to view step-by-step instructions for importing bookmarks into Firefox. Make a backup of your current Firefox bookmarks. Import the .html file into Firefox. In your preferred browser, use the Import bookmarks from Firefox option (the image below is from Chrome). In the upper right corner, click the white arrow icon, then select Bookmarks, and then click Import Bookmarks and Settings. The Import bookmarks and settings dialog box opens. From the drop down menu, click Mozilla Firefox. Click Import. You might be asked to close Firefox to complete the import process.